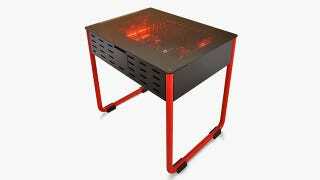 Gaming PC Prototype Is Also Its Own Table. Genius. Why is this not already a thing? And I'm not talking about the brave pioneers who have made their own versions of this. I mean, why isn't every company making commercial desktop PCs that are also a...desktop? It'd save space, it'd save time, it'd...OK, it wouldn't save money, but nothing is perfect. And I'd pay a few extra bucks for something that looks like a badass zombie 80s cocktail cabinet. This unit, Lian-Li's DK01, is pitched at serious gamers. It's got tool-less component mounting and modular HDD bays. The only thing it doesn't have is a price, since this is a prototype unit. If you want this to be a real thing, but Lian-Li about it.